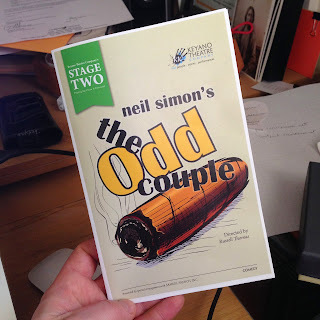 The best part of last night's preview performance of The Odd Couple was watching the reactions of the audience. They laughed, chortled and reacted in many of the spots I imagined they would and others that I did not. True to form, the cast responded well to the joyful outbursts coming from the seats, waiting just the right amount of time before continuing on and keeping the energy flowing. It was an exceptional performance fuelled by an energetic and appreciative audience. My job as director is officially done. I gave a few brief notes after last night's run and walked out of the theatre knowing that the next time I return it will be as an audience member. It's a strange and unfamiliar feeling; I've been on the other side of this continuum for a long time as an actor. I'm exceptionally proud of this ensemble and the team behind the scenes. Together, they have put together a delightful evening of theatre with solid production values, all on a very small budget. The Recital Theatre is a perfect space to enjoy this kind of show, the intimacy is lovely, as are the acoustics. We had a number of our media friends at the media call that happened prior to last night's run. I had taken a bunch of pictures that I will share after opening night later this evening. But I will share two things now. First, a preview video that our friend Jerry Neville made. Second, a cast photo that really says it all. Come and see this show. Treat yourself to an evening of "1000 laughs", according to photographer Sean McLennan. "You are crazy if you miss it," said Jason Beck. "The physicality of the performances was outstanding and it was hilarious," said Cindy Walker. Tickets are available at Keyano Box Office for the three remaining performances of The Odd Couple: Tonight, Friday and Saturday at 8 pm.